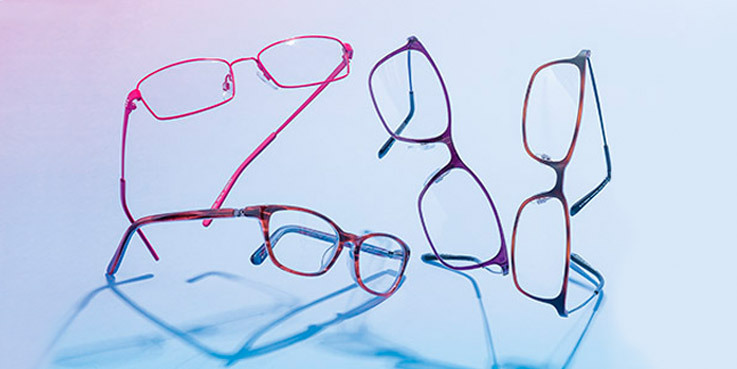 Ultra Flex is a durable, versatile range with an exceptional level of give that allows you to bend and flex the frame. These glasses are ideal for people who frequently put on and take off their glasses, or are less inclined to store them in their case. Turboflex has a patented hinge design that pivots through 180° to offer real durability and robust sides that flex whatever the angle. Memory metal offers elasticity and resistance to deformation. A flat sheet material is used to create ultra-modern, minimalist specs. Beta plastic shares the same properties as memory metal, combining both materials to create an ultra-thin and lightweight, flexible frame. Ultra Flex glasses are just £99, including standard single vision lenses, and you can get a second pair free in our great 2 for 1 glasses offer. You can even make sunglasses your second pair. This neat, blue, steel frame’s style has a sporty appearance. The cut of the metal sides gives it a racing look. Complete with 180° flex. A sporty, semi-rimless style with a modern, split temple design on the sides. The 180° flex adds comfort and durability. A simple, narrow, semi-rimless style with a flexible bridge and sides that feature a split temple design, adding to the architectural appearance of this frame. Simple and semi rimless, this style is slightly rounded in shape. The colour is a rich burgundy that flatters most skin tones. The tapered sides give it a modern touch. It also has a 180° flex. This frame provides a larger, rectangular lens shape that's ultra-modern, light and flexible. A thin, metal, semi-rimmed frame in deep blue and gunmetal with soft, adjustable nose pads and plastic tips that offer a comfortable fit. The shape of the front of this frame is really flattering to the face. The lightweight, hi-tech plastic and adjustable nose pads will ensure that it is a comfortable fit for most faces. The flexible, slim, gold sides and the thinness of the front bring a totally contemporary twist on a classic design. This frame is more than just a modern looking design. It also offers ultra-flex frames and ultra-light technology, giving them a real, ‘barely there’ feel. The modernity is continued in the neat, slim design of the arms. A neat, petite, semi-rimless style in a rich burgundy colour. Includes a pretty, art deco pattern on the metal sides. A modern, blue, steel frame with a flexible bridge and sides. Thanks to new developments in the manufacturing process, the sides are thicker and more modern than the traditional flexi designs.